12 Relationship-Saving Ways To Share A Closet With Your S.O. It’s hard enough to maintain order in your own closet, let alone one you share with your significant other. 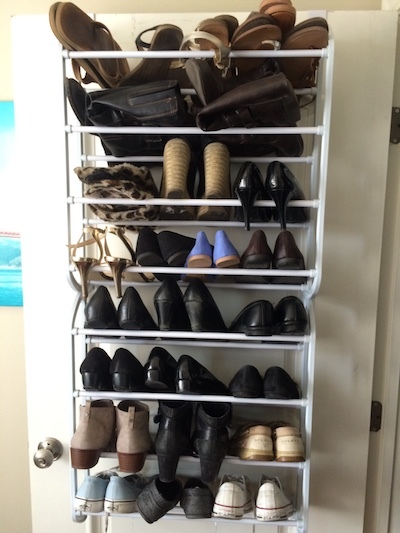 After all, sharing a closet means two personalities, two wardrobes, and double the amount of shoes in a tiny space. If that mental picture sends you into panic mode, don’t worry. It’s totally normal to be a bit stressed about giving up space that was once all yours. But before you start searching for studio apartments, know this: Sharing closet space is totally doable. You just need some creativity, smart planning, and an open line of communication with your partner to make it happen. The key to maintaining an organized closet is to limit what goes inside it. Before you start arguing with your partner over who gets the highest shelves, you each need to cut down the amount of stuff you had in your individual closets. That means clothes, shoes, accessories, costumes, and tools, for example. Separate your things into categories, then sort through your belongings one by one. Donate any item you don’t love or wear regularly. Read these 15 actionable decluttering tips from Certified Professional Organizers. Or use our KonMari method cheat sheet to declutter your home like Marie Kondo. Even if your partner doesn’t have the tidy gene (and claims to trust your judgment), it’s important to organize your closet as a team. Discuss your habits, morning routines, and which items you wear regularly. 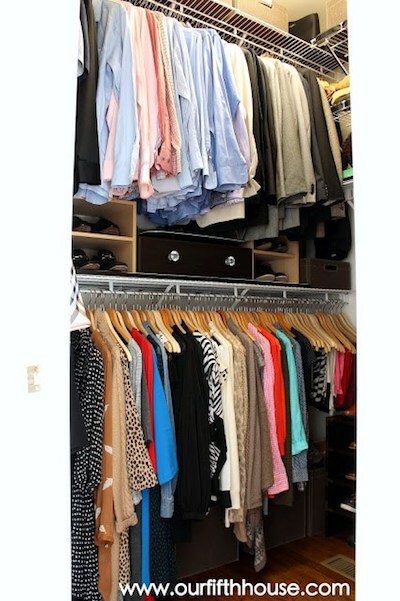 Doing this will help you figure out how much space each person needs and where to store certain clothes. If you both get ready for work at the same time, try storing your stuff on separate sides of the closet to avoid getting in each other’s way. On the other hand, if you use the closet at different times of the day, you might be able to share drawer and hanging space more easily. You don’t need to split your closet space 50/50 if you don’t want to. 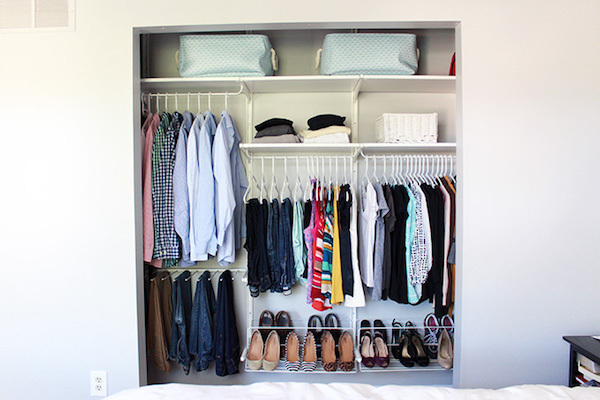 Just focus on organizing your clothes in a way that makes it easy for both of you to get dressed in the morning. Limit your stuff to the basics. Store the pieces you wear every day front and center, and stash off-season items — like skirts, shorts, sandals, and bathing suits — in your coat closet or a bin under the bed. Pro Tip: These 53 insanely clever bedroom storage hacks and solutions will help you save serious space. 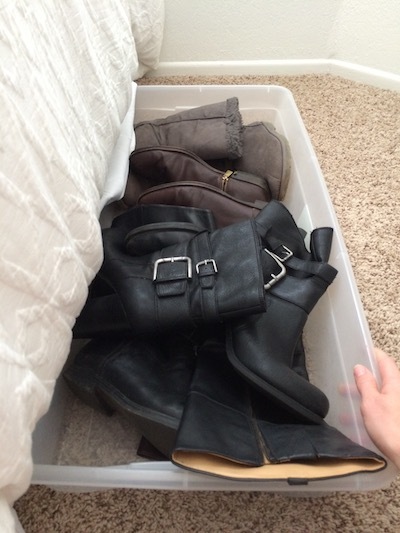 If you’re low on drawer or shelf space, store dress shoes, scarves, belts, and hats in baskets or shoe boxes. Just make sure to label or color-code each person’s boxes so it’s easy to find what you both need when you’re scrambling to choose an outfit before work. Matching hangers are like non-stick pans and cordless vacuums — you don’t think you need them, but once you start using them you can’t imagine ever going back. 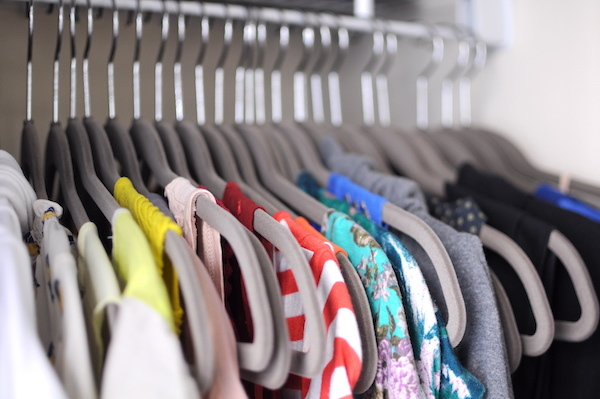 Coordinating hangers limit harmful visual clutter in your closet and help save space. Velvet hangers in particular are super slim and take up half the room their bulky wooden and plastic counterparts do. 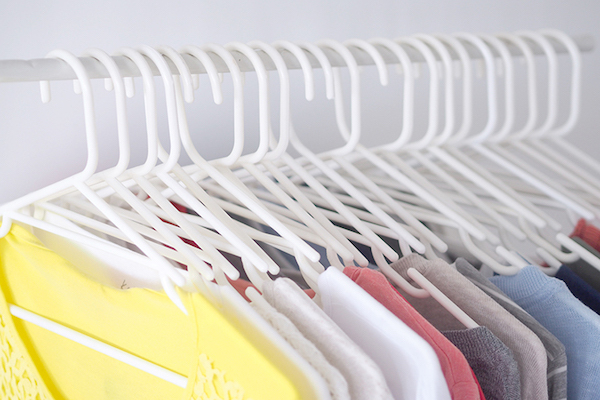 Pro Tip: Use Hang A Bunch multi-purpose hangers to hang six times as many clothes on just one hanger. When you’re combining two wardrobes into one closet, you need as much space as possible to keep your things organized and accessible. Use high shelves to store bins. Mount sturdy hooks on the back of the closet door (here are eight more hidden storage areas in your home). And take advantage of open floor space to store a shoe rack or small dresser. No matter how tiny your closet is, make space for a laundry basket or hamper. Having an easy place to stash your dirty clothes means they won’t end up in smelly piles on the floor. If that won’t keep the relationship strong, we don’t know what will. Vertical storage space is a serious game-changer. 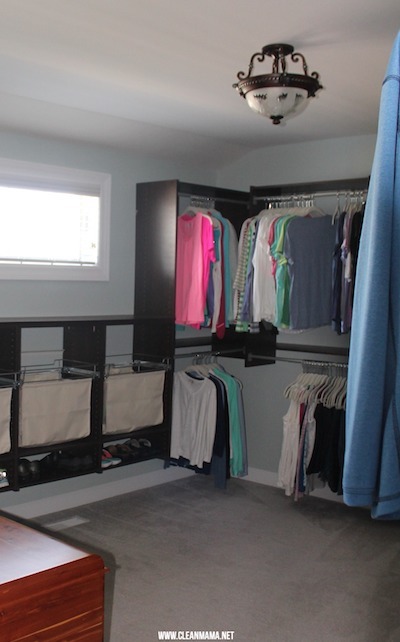 Even the smallest, most poorly designed closets have plenty of vertical storage possibilities. 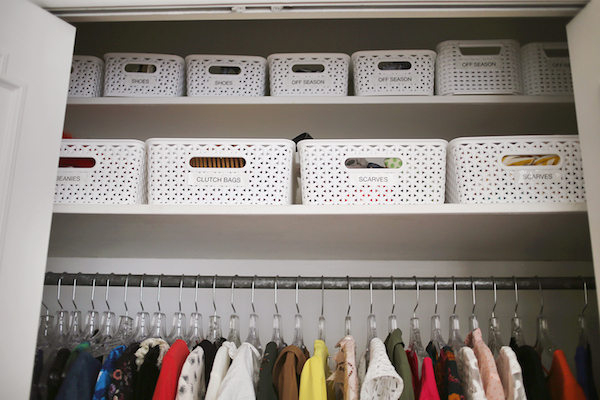 Save shelf space by storing sweaters in a hanging organizer. Hang a shoe rack on the back of your closet door. Use a towel rod for scarf and tie storage. Want your stuff to double as art? The more convenient it is to put away clothes, the more likely both of you are to do it. That’s why it’s smart to use storage solutions that make sense for you and your partner. If you both hate folding clothes (here’s how to fold and store 10-20 more shirts in the same space required to hang 10), get rid of the shelves in your closet and install an extra hanging rod. Or, if your partner dislikes bending down to put his shoes away, store them in a hanging organizer. Bottom line: Make your closet work for you two, not against you. Every couple months, set aside time with your partner to reevaluate your stuff and decide what you want to keep. Get rid of anything ill-fitting, unloved, unworn, or damaged beyond repair. 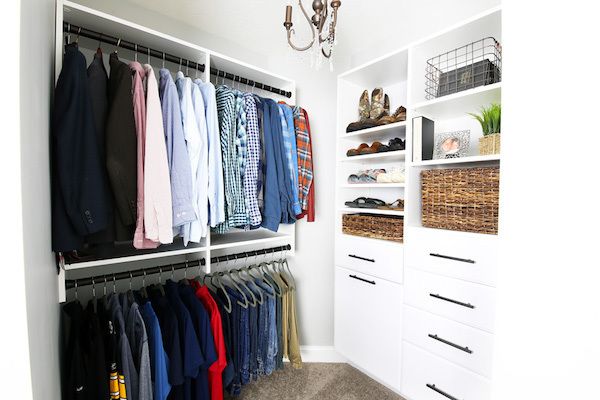 Paring down your stuff simplifies the process of choosing an outfit and makes it easier to organize your closet. Win-win. 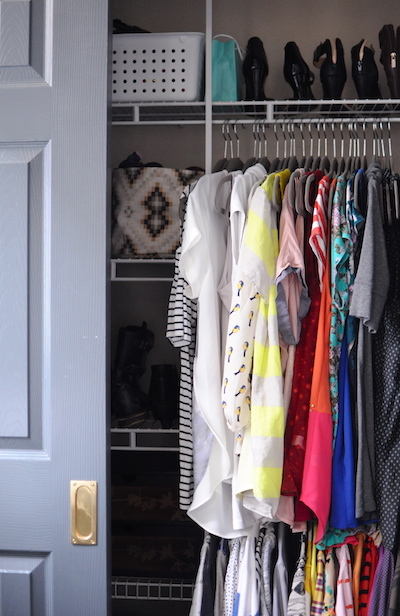 Respecting one another’s space and belongings is key to maintaining shared closet harmony. Make an effort to keep your area of the closet tidy and don’t let your collection of workout shorts or jean jackets overflow into your partner’s zone. If you’re running out of room for your stuff, consider donating a few items (MakeSpace offers free Goodwill donation pickups in NYC, Chicago, and DC) or rotating pieces from storage. Let go of stuff you don’t need. Then, let MakeSpace store everything you and your partner can’t fit in the closet. When you need your swimsuit and/or carry-on back, browse the convenient online photo catalog of your stuff, click the items’ photos, and we’ll deliver them to you.